Quick answer: It’s the Russian GPS. There’s an interesting history to it that makes it even more interesting. The global positioning system (GPS) was developed by the US Military, so troops on the ground would know where they were and missiles would know where to target. In the early days, it wasn’t the smartphone-friendly system we think of today. In fact, other nations saw GPS as a legitimate threat. In fact, back in the 1970s the United States had one big enemy on the other side of the world, and they didn’t think GPS was very friendly at all. Both systems were developed at the same time, with top-secret launches taking place throughout the 1970s, 1980s and 1990s. Both systems work the same way, by calculating distances based on the differences in time signals from multiple satellites. In fact, they are so similar that it’s possible that one side or the other had access to their enemy’s plans. When both systems became fully operational in the early 1990s, the times had changed. The USSR had given way to the Russian Federation, and no one expected the two superpowers to fight each other. 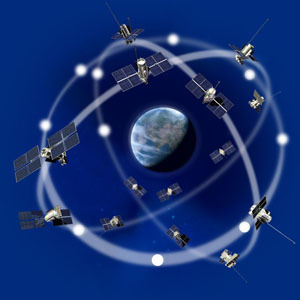 GPS technology was used in war in the 1990s, however, and it is possible that GLONASS technology was too. Here’s where the stories differ. GPS started a whole industry in the United States, providing free access to real time maps. By the mid-2000s GPS technology showed up everywhere from phones to cars. On the other hand, GLONASS technology had crumbled. Russia had hard times in the 1990s and could not afford to keep up the system, which required regular satellite launches to keep it working. It took another decade but Russia’s economy recovered and with it came a renewed commitment to GLONASS. Millions of rubles were put into satellite launches and today’s GLONASS is as strong as GPS. It provides an important backup system for millions of devices that require “positional awareness,” and thanks to a Russian plan to put a 25% tax on any device that supports GPS and not GLONASS, it’s in most devices that are imported into Russia, including the iPhone 4s and iPhone 5. In the United States, there are many devices that have GLONASS support due to that Russian tax, but very few devices actually use it here, preferring GPS instead. GPS has a multi-year advantage with American map companies and there are no plans to bring GLONASS in as a legitimate competitor here. However, if you travel, you may find someone using GLONASS on a smartphone or in a vehicle, and you’ll know exactly what it is, and why they’re using it! There’s a great animation showing the orbits of different GPS satellites here, courtesy of Wikipedia.